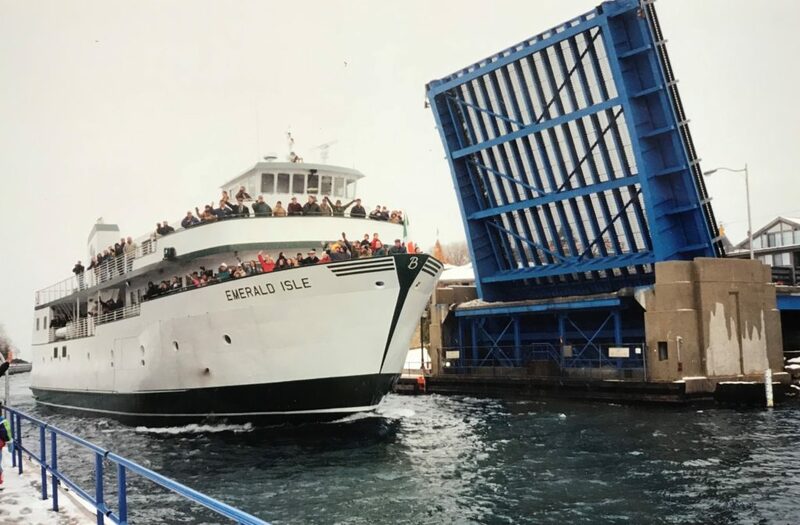 BEAVER ISLAND, MI – On December 4th, 1997 the Beaver Island Boat Company (BIBCO) celebrated the Maiden Voyage of the M/V Emerald Isle as the boat headed to Charlevoix from Beaver Island for the first time. To commemorate the occasion and honor the Emerald Isle’s 20th Anniversary of her Maiden Voyage, the Beaver Island Boat Company will offer free passenger transportation aboard the Emerald Isle on December 4th, 2017. If you travel on the 4th to the Island or from Charlevoix we will give you an additional one-way ticket for your return that must be used by December 22nd. Please keep in mind that all departures are weather permitting. BIBCO would like to remind passengers that during the non-peak season you cannot travel to the Island and back to Charlevoix in the same day by using the Ferry. Therefore, there will not be a boat returning to the mainland later in the day, should you decide to take the 11:30 am departure to the island. The Emerald Isle is the newest and largest vessel operated by BIBCO. The Emerald Isle was designed by Timothy Graul Marine Design in Sturgeon Bay, Wisconsin and was built in East Boothbay, Maine by Washburn & Doughty Associates, Inc. She is 130 feet in length, 39 feet wide, and draws 8.5 feet with a top speed of 14.5 knots and maximum capacity of 294 passengers with capability for a semi-truck. She has an excess of 150 indoor/covered seats, 5 restrooms, fixed stabilizers, power outlets and food/refreshment vending machines. The Beaver Island Boat Company is grateful for the support of both the mainland and island communities and the Beaver Island Transportation authority. They look forward to creating many more memories aboard the Emerald Isle in the years to come with their loyal passengers. Disclaimer: Passengers must travel on 12/04/17 to receive free passage. Commemorative tickets will be valid on 12/04/17 only. Limit one ticket per person. If you ride the Emerald Isle one-way on 12/04/17 and will be utilizing the ferry for a return trip (whether to CHX or BI) prior to the end of our 2017 season, you will receive a free one-way ticket. Please be advised that free one-way will expire by 12/22/17 and you must ride the boat on the 4th to receive your free one-way return.